The University Council of Educational Administration awarded its annual Jack A. Culbertson Award to The University of Texas at El Paso’s David DeMatthews, Ph.D., assistant professor of educational leadership and foundations, during the group’s 31st annual convention Nov. 16, 2017, in Denver. Colorado. The recognition is an early career award for outstanding junior professors of educational administration. 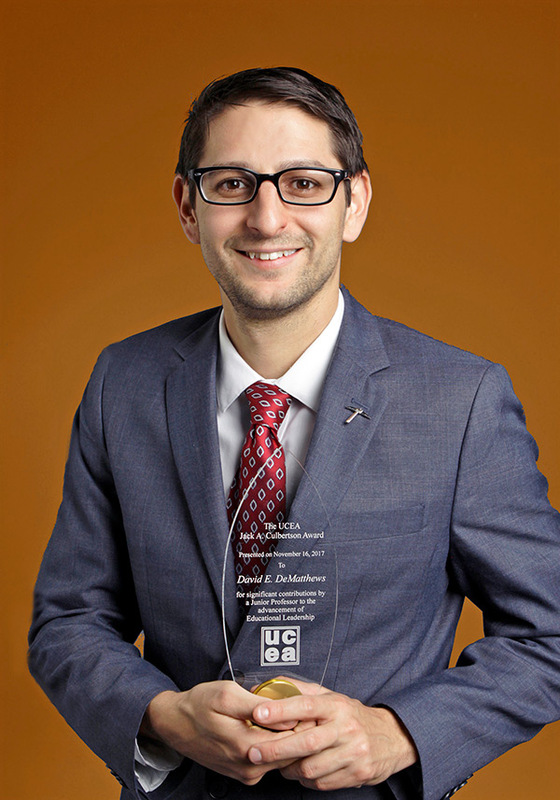 DeMatthews, who started at UTEP in 2013, said he was honored to receive this prestigious award because it connects him to past recipients who have gone on to successful careers as academic leaders and dedicated scholars. During his introduction, DeMatthews was described as a prolific scholar whose articles regularly appear in top-tier, peer-reviewed academic journals, a contributor to many national education committees, and a community advocate for socially just schools. He also was lauded as an exceptional researcher for his work that encompasses school leadership for social justice, dual-language programs, school-community leadership and advocacy, and district leadership for policy analysis. “I think it’s exciting that the research and teaching that is happening at UTEP is being recognized by education scholars across the nation and in the nation’s top research universities,” said DeMatthews, who earned his doctorate in education policy and leadership from the University of Maryland College Park, his master’s degree in secondary education and teaching from Johns Hopkins University, and his bachelor’s degree from Rutgers University in political science and government. UTEP’s Elena Izquierdo, Ph.D., associate professor of teacher education, lauded DeMatthews for his contributions to their shared research into ways to enhance the knowledge and skills of teachers who work with English Language Learners through dual-language programs. Their work has involved classroom observations and interviews with administrators, teachers and parents. She said his efforts have led to better prepared leaders on K-12 campuses that engage in dual-language programs. Donald Hackmann, professor of educational policy, organization and leadership at the University of Illinois Urbana-Champaign, said DeMatthews’ research demonstrates the potential to impact school leaders’ daily practices. “His continuing efforts to advocate for the empowerment of students, educators, parents and communities are noteworthy,” Hackmann said.